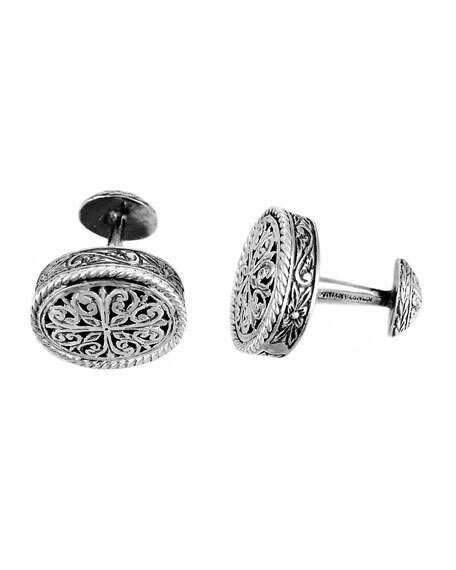 Carved sterling silver cuff links by Konstantino. Ermenegildo Zegna cuff links. Rhodium-plated sterling silver with herringbone engraved trim. Round face with black mother-of-pearl inlay. Engraved logo text in back stone. Approx. 0.6"H; 0.6"W; 0.9"L. Made in Italy. John Hardy men's cuff links from the Legends Collection. Naga dragon motif. Brushed sterling silver. Blue sapphire eyes. Whale backs. John Hardy men's cuff links from the Legends Collection. Naga dragon motif. Brushed sterling silver. Blue sapphire eyes. Whale backs. Handcrafted in Thailand. Konstantino cuff links from the Color Classics Collection. Mother-of-pearl inlays with intaglio relief cross motif. Intricately etched sterling silver. 0.8"L x 0.5"W. Handmade in Greece. Tateossian cuff links with functional gears. Black gunmetal-plated base metal. Brass detail. Whale back closure. Imported.